Annapolis, Md. 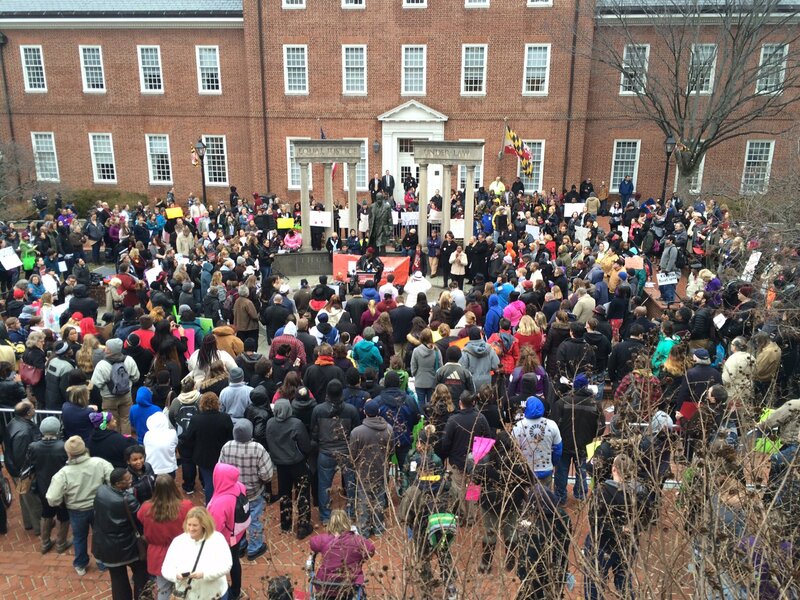 (February 25) – More than 500 advocates and families rallied today in Annapolis to increase access to behavioral health services. Behavioral health is a term that covers the full range of mental and emotional well being, including mental health and substance use disorders. Speakers called on the General Assembly to pass the Behavioral Health Coalition’s legislative platform, which includes the Keep the Door Open Act. The Act would ensure that adequate funding for community health providers is included annually in the state budget. The Act (SB497/HB595) is sponsored in the Senate by Senator Guy Guzzone and in the House by Delegate Antonio Hayes. The Keep the Door Open Act indexes behavioral health provider rates, which have only had six modest increases in the last 20 years, to the cost of medical inflation. Advocates say the bill is needed to attract and retain qualified licensed professionals and direct care workers by ensuring fair and stable provider rates. Community health providers administer traditional outpatient services, mobile treatment, crisis services, withdrawal management, rehabilitation, residential treatment, vocational services and housing. Speakers included individuals who use or depend on behavioral health services, along with family members and health care providers. Several state elected officials also addressed the large crowd, including Senators Guy Guzzone and Catherine Pugh, along with Delegates Antonio Hayes, Sandy Rosenberg, Bonnie Cullison, Eric Luedtke and Brooke Lierman. Advocates note that those who need mental health and substance use disorder treatment live among us, and that nearly all Marylanders have a friend, neighbor, family member or coworker who need behavioral health services. These include some of the most vulnerable Marylanders – military veterans, the elderly, people living in poverty and children. Behavioral health includes substance use disorder treatment and Maryland’s growing opioid overdose rate prompted Governor Larry Hogan to establish the Heroin and Opioid Emergency Task Force, which released its findings in December. Use of illicit drugs has steadily increased in Maryland over the past four years and now exceeds the national average, according to the Substance Abuse and Mental Health Services Administration’s recently released 2015 Behavioral Health Barometer. Advocates also spoke in support of legislation (SB551/HB682), which creates a strategic plan to implement 24/7 statewide access to walk-in services and mobile crisis care teams. Only three of Maryland’s 24 county jurisdictions have a walk-in crisis center. The legislation would also require better data collection and outcomes measurement. The Keep the Door Open Act (SB497) and the crisis services bill (SB551) are each being heard this afternoon in the Senate Finance Committee, room 3 East in the Miller Senate Office Building. Hearings begin at 1:00pm. Advocates are tweeting about the rally using #KeepthedooropenMd.